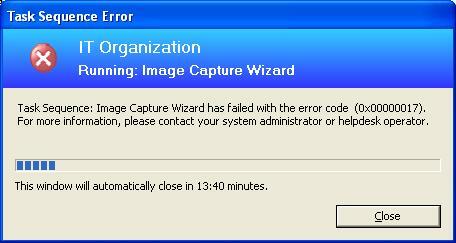 "Task Sequence: Image Capture Wizard has failed with the error code (0x00000017). For more information, please contact your system administrator or helpdesk operator." Check out %windir%\temp\smstslog or %windir%\system32\ccm\logs\smstslog if you have a client/agent installed. In my case, we had a broken media and the wizard couldn't copy one of the files it needed.. re-burning it solved the issue.